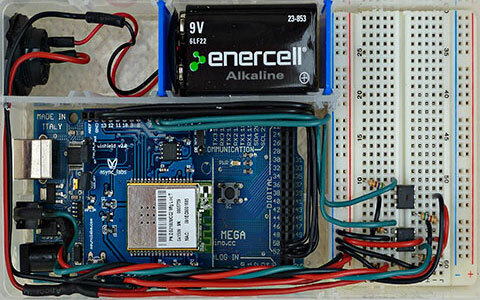 The notion is to control the Arduino LED using an iPod Touch or iPhone via WiFi. Here is the UI. The Start/Stop button starts and stops the blinking of the LED on the Arduino board (the LED connected to pin 13). 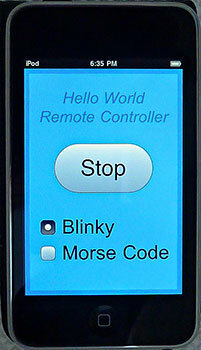 The two radio buttons, "Blinky" and "Morse Code", control whether the LED blinks in a simple ½-second on/off pattern or the Morse Code for "HELLO WORLD". Click on the buttons to control this simulated Arduino. Go to the Safari browser on your iPod or iPhone. Enter "svbreakaway.info/tp/myipod.html" on the address bar and click on "Go" (or simply click on that link if you are viewing this page from your iPod/iPhone.. in which case, first note the next step about adding it to your Home Screen). then Add to Home Screen and finally Add. 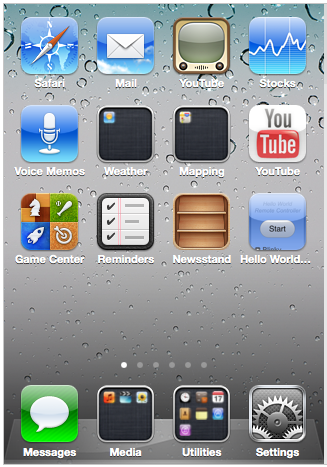 The page lays out properly when you run it from your Home Screen - ie. without Safari displaying it's address bar. <-- Click on that button. In the upper left corner of the window that opens up you should see a Serial No. Enter that number in the box next to the Link button on your iPod/iPhone. Then click on the Link button. You should then be able to control your simulated Arduino from your iPod/iPhone. Here is a monitor of all the current connections. When you are connected, you should see your IP address in the table. If you have an Arduino and either the Asynclabs WiShield 2.0 or Sparkfun WiFly shield (and an iPod Touch, iPhone or any browser that can make a WiFi connection to an ad-hoc device), please download the code and try it out. Let me know if you have any problems with it (). The URL includes the name of the button and it's value. E.g. So, it's a small number of bytes passed. The server parses the URL, changes the state of the blinking settings and returns a small XML response, e.g. For the Start/Stop button the browser code updates the state of the button, thus confirming that the command was received and executed. This confirmation step for the radio buttons is something that should be added to the code. The Arduino code that controls the LED uses a timer. The Arduino function, delay(), would block the webserver from responding - not a good thing. Using a timer instead was easy and seems to work well. My version of the WiShield webserver code (in the /libraries/WiShield/ folder) has been considerably hacked (by me) for tracing and to instrument the load on the server. I'll try to clean up the code and document that instrumentation interface at some point. I found setting up the ad-hoc mode in the WiFly shield to be a little quirky. That setup code starts around line 324 in the sketch if you want to play around with it. For my boat monitoring projects this winter, I'd like to interface a bunch of sensors to my microcontrollers. This blog entry will describe my results from interfacing them to a Raspberry Pi and/or BeagleBone - just to shake things out and maybe try to organize a plug&play approach. I suspect the RasPi and BeagleBone will be my preferred microcontrollers (rather than the Arduinos that I have used in the past). The Arduinos are just too limited, IMO. 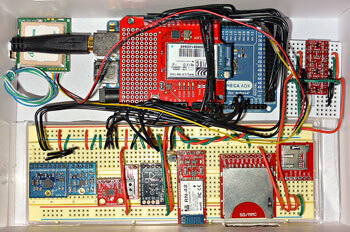 the various sensors, a Bluetooth module, and the SD card readers. 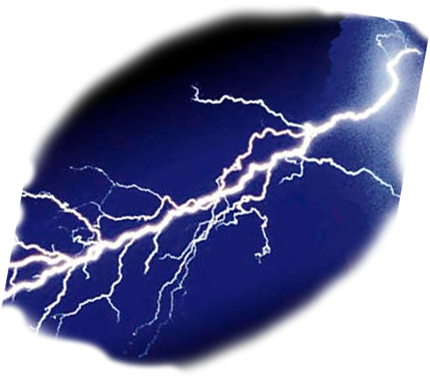 appropriate microcontroller, PCB breadboard, container, power supply, etc. Plus, use solder connections instead of the plug-in breadboard. And seeing this installation art makes me want to add some kind of interactive light - maybe to the underside of the hardtop bimini. Something inspired by bioluminescent plankton that I've seen in the wake. Or a reflection like this but "reflected off" somebody in the cockpit. Hmm. Essentially the Boat Performance Monitor, but portable and waterproof - that I could use on a sailing dinghy to monitor and improve my performance. Monitor engine RPM, temperature, oil pressure, sound, boat speed. Plot boat speed vs. engine RPM (ideally taking into account effect of wind and waves). Monitor fridge on/off cycles, power usage, fridge/cabin/seawater temperatures. Possibly modify compressor speed to minimize power usage as described in the Frigoboat section of this Practical Sailor article. I found a cool HTML grapher on http://www.aharef.info/static/htmlgraph/. Kudos to Marcel Salathé and Jeffrey Traer Bernstein. It creates a graphical depiction of the HTML tags on webpages. The individual nodes (that is, the inner circles of each of the nodes in the plots) are colored according to the HTML tag (blue for <a>, green for <div>, red for <table>, etc). I added code to allow viewing more than one page. A sample screen shot is shown below. 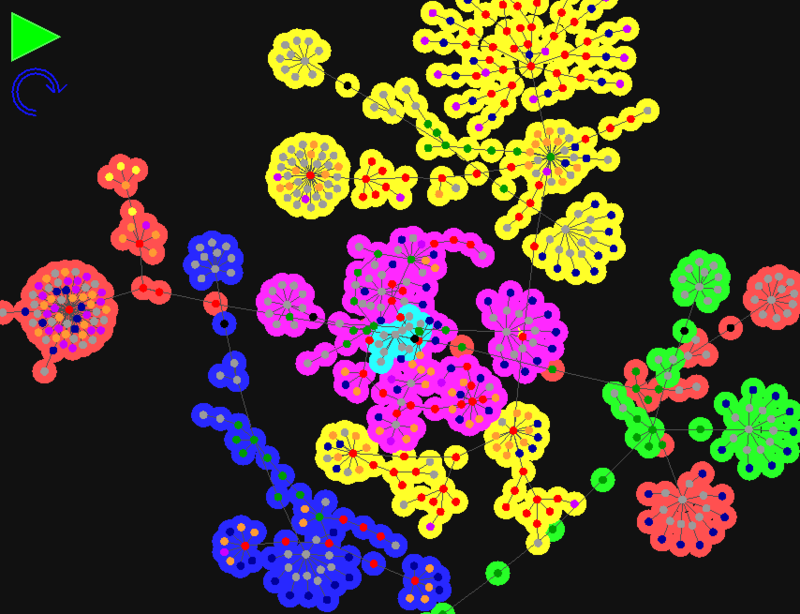 Each connected blob represents a different page on my website (/cr34-analysis.php is yellow, /index.php is red, /sv-breakaway.php is blue, /about-me.php is green, etc). The page you're now reading, /tp.php, is purple. It looks like spindly creatures under a microscope. To me anyway. In the future, I'd like to show the links between pages and add the ability to pick which pages to show. Commented out the import java.util. * in ParticleSystem and RungeKuttaIntegrator. I thought I would need to do something with ArrayList, but thankfully that appears to be supported in Processing.js so there was nothing more I needed to do there. To remove particles and attractions from a ParticleSystem, I tried using the existing removeParticle(Particle) and removeAttraction(Attraction) methods. They seem to work OK in the IDE, but not in the Processing.js environment. I didn't spend any time investigating. Using the removeParticle(int) and removeAttraction(int) versions seem to work OK. I added a couple methods (marked in the code with "mrn") to make using the "int" versions a little easier. 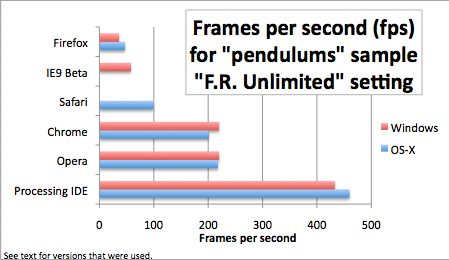 simplifying my Pendulums sample considerably. There is a small change to the Traer library API, namely change Vector3D to PVector. Here is my previous version of the library and pendulums sample code for reference. How well does the performance scale with the complexity of sketches using this library? That is, in a larger animation (more objects, a larger canvas), does performance become unacceptible on the browsers that are marginal on this (as yet) very simple sample? Are there easy changes to the application or library that result in good gains? -- the low-hanging fruit. Why is there such a big spread between browsers? Will some browsers/platforms do better on graphics applications because they have a better graphics library implementation/hardware assist/underlying support?